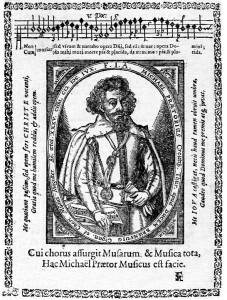 Praetorius published the Syntagma musicum in 1619. Michael Praetorius was not only a fine and masterful composer; he was also a virtuoso organist and instrument builder. The woodcuts that he published in his book Syntagma Musicum, which depict with scientific accuracy the dimensions of the common instruments of his time, have become invaluable in the modern recreation of these instruments. The book is also a beautiful resource for performance practices such as the ones you will hear in our upcoming concert, Praetorius Christmas Mass. Given that most of the weird and wonderful instruments he would have used will be part of the show, we thought it would be fun to give an introduction to their look and sound! Cornetto – One of the most beautiful and enchanting of instruments, the cornetto is often compared to a fine singer! Cornettos are a curved, wooden instrument, conical in shape and fingered much like a recorder, but played with a tiny mouthpiece that is still used in modern brass. Having tried to play this thing on numerous occasions, I have tremendous respect for those who play it with virtuosity and delicacy. This thing is really tricky! The cornetto comes in many sizes, mimicking the voices of a choir. The bass cornetto is often seen in museums and photos as the giant, twisted, black instrument known as “the Serpent,” for its striking resemblance to a monstrous, black, coiled snake! 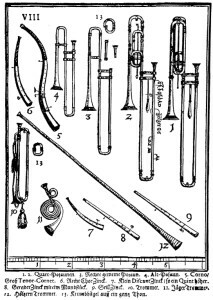 There are also straight cornetti with built-in mouthpieces that play with a gentler sound and are known as “mute cornetto.” Played in combination with voices, strings and winds, but especially with the sackbut, the cornetto was a staple of all 15th, 16th and early 17th century ensembles. For an unknown reason, the instrument lost favour in the 18th century and virtually disappeared until its renaissance by music historians in the 1960s. Sackbut – Clearly an instrument with a name one doesn’t forget, the sackbut is a direct predecessor of the modern trombone, and looks strikingly similar to the instruments used in bands and orchestras all over the world today. Featuring a double slide, a new technology in the 16th century, the sackbut changes its fundamental harmonic easily by adding or subtracting its length, thereby making it a fully chromatic instrument. Sackbuts had less physical rigidness, thus making it gentler in sound than its modern counterparts and well suited for playing with voices, the cornetto (its favourite partner), and all manner of wind and string instruments. Like most instruments in the Renaissance, sackbuts range in size from soprano through to bass and even contrabass. The largest of these have slide-extending handles to allow the player to reach the lowest positions. Most common are the alto, tenor and bass versions. Its curious name comes from the old French words “saquer – bouter,” meaning “push – pull.” The English changed this to sackbut! The dulcian and rackett families. 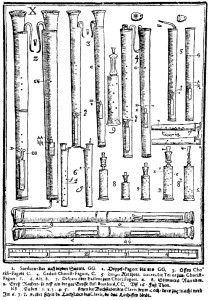 Dulcian – Also known as “curtal,” these are the direct predecessors of the modern bassoon. Without the complex mechanical apparatus of modern instruments, these lovely, buzzy double reed instruments had a limited range of just a couple of octaves, again requiring many sizes to cover the full range. The largest is 16 feet long, and the smallest, just one foot! Dulcians add tremendous warmth and colour to any ensemble and have been one of my favourite instruments to pair with while playing my sackbut. Added to an a cappella choir’s bass line, dulcians are an integral anchor for perfect tuning and rock solid bass lines! Rackett – I’m so delighted that we will have three, yes three, wonderful bass racketts in this performance! I don’t believe Winnipeg audiences have ever heard one, let alone three, of these magical instruments before. Racketts are essentially “pocket bassoons.” There are 16 feet of cylindrical tubing wrapped in foot-long lengths inside a larger wooden casing that is one foot long. A large, double reed, attached to a copper bocal, provides the sound. The resulting peppermill-looking instrument plays the same range as a bass dulcian, but its small size and cylindrical shape mean that the fundamental harmonic is very thin and thus they sound very buzzy. The effect is magnificent and will be heard in one of the gentlest motets of the Praetorius Christmas Mass. In Part 2, we will explore more of these weird and wonderful instruments! 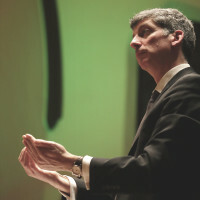 An early music specialist, Ross Brownlee conducts Camerata Nova’s period concerts. While at McGill University, Brownlee was mentored by Dr. Douglas Kirk, a world-class expert on historical instruments and early music repertoire. In 2000, Ross continued his studies in early music in Vancouver, investigating the performance practice and history of the Renaissance trombone (sackbut) with leading musicians from around the world. For many years he has been a teacher and coach at the Amherst Early Music Festival in New London, Connecticut. Initially a singer in Camerata Nova, Brownlee now acts as a co-conductor, designing and conducting early music concerts while also acting as a member of the Board and of the Music Committee.